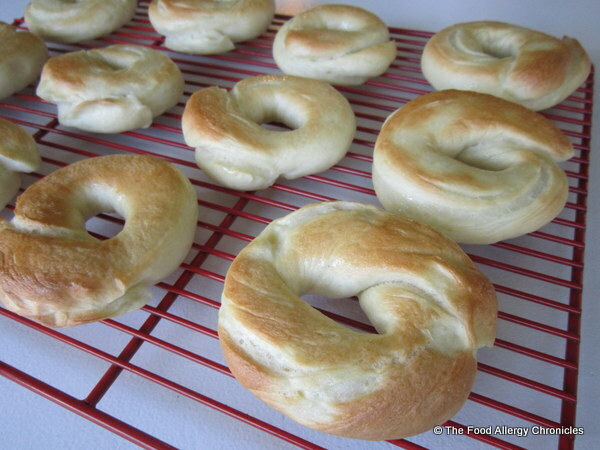 Posted on January 21, 2013 by Susan H.
Dairy, Egg, Soy, Sesame and Peanut/Tree Nut Free Bagels. Crispy on the outside…chewy on the inside! Bagels are another one of those packaged items found in the grocery store that tantalize my son Michael. (food allergies include: dairy, egg, sesame, peanut/tree nut, beef, fish, shellfish, mustard, lamb and raspberry.) 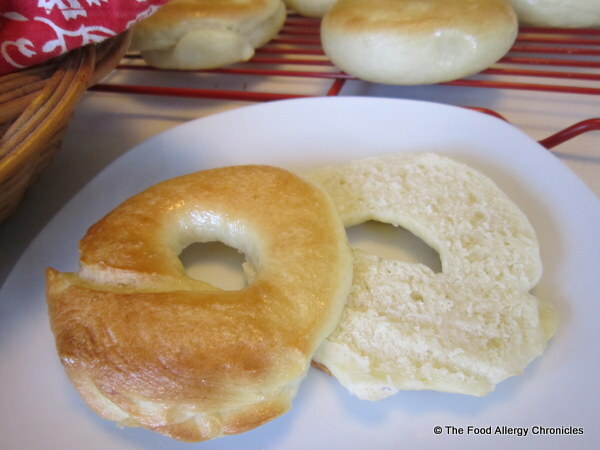 Due to the allergy warning label, bagels are not a convenient breakfast or snack for our family to purchase. It has been a few years since I last made Dairy, Egg, Soy, Sesame and Peanut/Tree Nut Free Bagels…September 15, 2007 to be exact. So you can imagine the excitement in our house this past weekend when I announced that bagels were on the menu for Sunday. 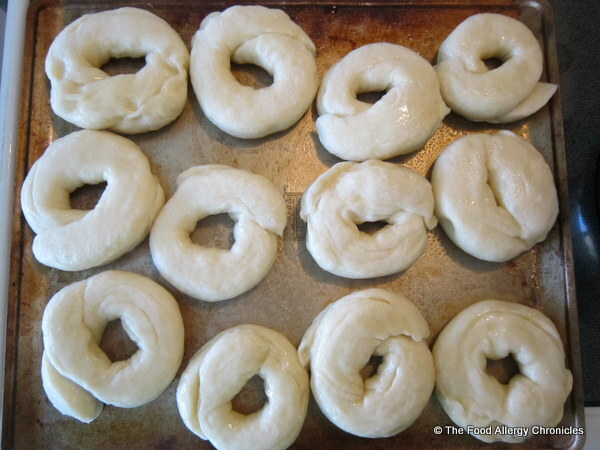 I discovered a bagel recipe to adapt in Canadian Living Cooks Step By Step Cookbook by Daphna Rabinovitch. I could not find the original recipe online. Below is my adapted version. Mix the above three ingredients together just before adding to the yeast mixture. In a large bowl, dissolve the 1 tsp of sugar in the warm water. Sprinkle with the yeast and let stand for 10 minutes or until frothy. Whisk in the above mentioned egg replacement with the canola oil. Using a wooden spoon, beat in 2 cups of the flour with the sugar and salt until smooth. Gradually stir in the remaining flour until the dough is soft not sticky. Roll the ball of dough in a bowl greased with canola oil, cover with plastic wrap and let rise in a warm draft-free place until it has doubled…approximately 1-1 1/2 hours. Punch the dough down and knead on a lightly floured surface. Divide the dough into 12 balls. Roll each ball into 12-inch ropes…cover with a tea towel when each has been made. Overlap the ends of the rope by an inch…pinch to seal. Place on a lightly floured baking sheet, cover with a tea towel and let rise for 15 minutes. In a wide saucepan, when the water has come to a boil, add the sugar. Carefully slip in 3-4 bagels at a time and cook at medium heat for a minute before turning and cooking a further minute on the other side. 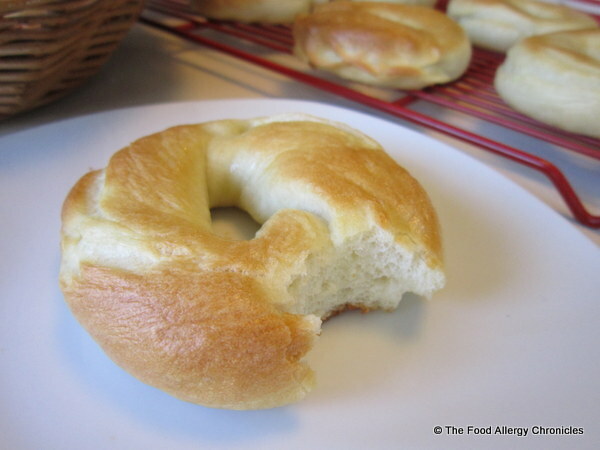 With a slotted spoon, transfer bagels to a baking pan that has been covered in canola oil. 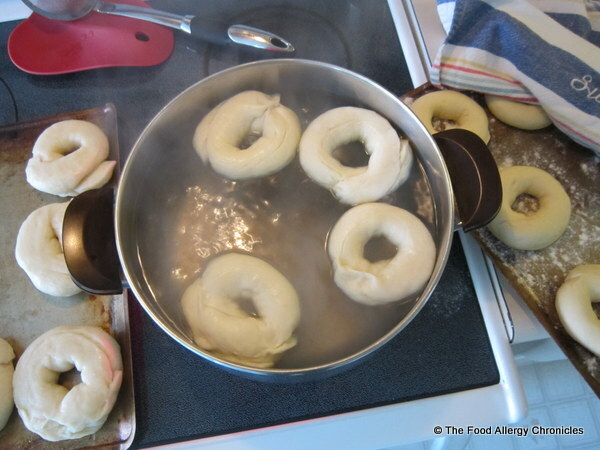 Spritz the tops of the bagels with canola oil and bake at 400 F fir 20-25 minutes until the tops are a golden brown. Let cool on cooling racks. The boys loved them, Andy included…I think I will be needing to bake up another batch today…my bread machine ‘died’ yesterday! 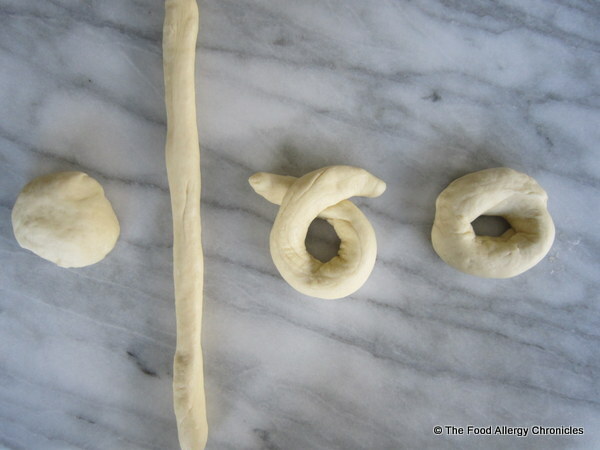 Tip 1: Rolling out the dough into ropes is easier on the marble slab/counter without any extra dusting of flour…the stickiness of the dough also helps to seal the bagel together. 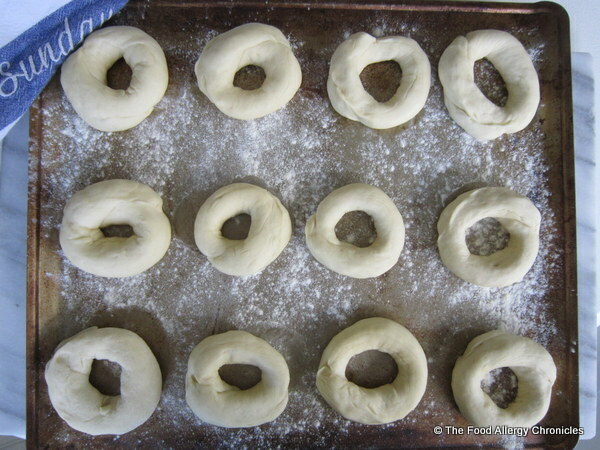 Tip 3: Make sure when poaching the bagels, the water is not at a rolling boil as the bagels are more inclined to come apart. If they do…do not fret…place them on the oiled baking sheet and let them dry a bit, they will feel sticky and can be pressed back together/leaned up against one another to keep them in place. P.P.S. Also, do not worry if you add the sugar before the water comes to the boil…I did and all was well. P.P.P.S. Making them again today…correcting all my ‘mess ups’. Today I let the dough rise closer to 2 hours as I had more time…yesterday, I probably only let the dough rise 1 hr 15 minutes. The boys will be thrilled there are more bagels…Michael toasted a bagel for breakfast and packed the last two for his lunch for today. 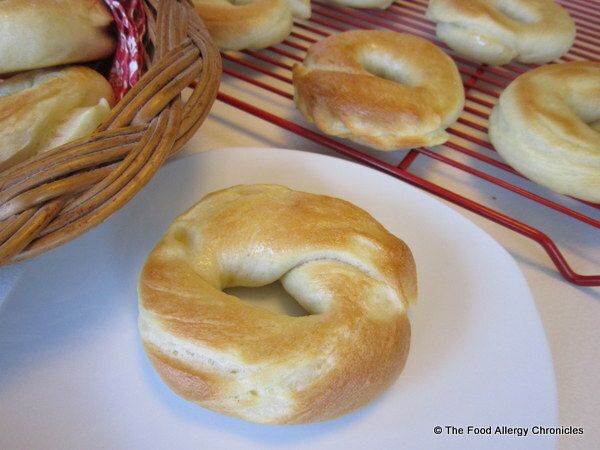 This entry was posted in allergies, baking, breads, breakfast, dairy free, egg free, multiple food allergies, peanut/tree nut free, sesame free, soy free and tagged Canadian Living Step By Step Cookbook, Dairy Egg Soy Sesame and Peanut/Tree Nut Free Bagels, Natur-a Rice Beverage, Natur-a Soy Beverage by Susan H.. Bookmark the permalink.